The Thermo Forma 3950 is a Large Reach In CO2 incubator which allows you the flexibility to grow cultures and large volume products. This reliable reach in environmental chamber is ideally suited for researchers looking for short term growth experiments and can accommodate rockers, spinners, shakers and stirrers. The Thermo Scientific Forma 3950 come with two GFI electrical outlets and is controlled by a microprocessor. The Forma 3950 provides high Relative Humidity to eliminate products from drying out which works well with medium term cultures. This CO2 environmental chamber maintains accurate temperature uniformity and chamber shelves are adjustable to accommodate large volume cultures. These easy to use environmental chambers create idal growth environments by providing directed horizontal laminar airflow within the chamber. The Forma Reach-In CO2 Incubator comes with three convenient water fill option, semi automatic, manual, automatic and includes a heated triple-pane glass door to reduce condensation. Ther Thermo Forma 3950 includes access ports allowing for third party senors and probes to be added within the stability chamber. Tight temperature uniformity ensures the best culturing growth enviornment possible. This system comes equipped with Enviro-Scan controls along with audible alarm, visual alarm and remote alarm contacts. There are three Relative Humidity (RH) settings and three water fill options to choose from. Selectable temperature setpoints can be toggled through the control and user has the option to set overtemperature alarm. The interior of the Thermo Forma 3950 is constructed out of a polish finished stainless steel to allow for easy wipe down cleaning. The CO2 inlet takes a ¼” barbed hose and has a CO2 range of 0 to 20% with accuracy of ±0.1%. Contact us today to learn more about our Thermo Scientific 3950 CO2 Reach In Incubator. 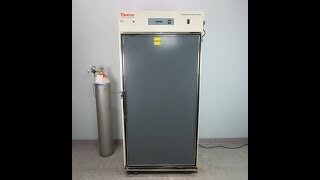 This Thermo Scientific 3950 Reach In Incubator has been thoroughly inspected and is performing to expectations. All of our lab Equipment comes backed with our standard warranty. Should you have any questions, please don't hesitate to contact us.